in Side dish, south Indian recipes, Veg. Thoran is a popular dry dish from the cuisine of Kerala, India. 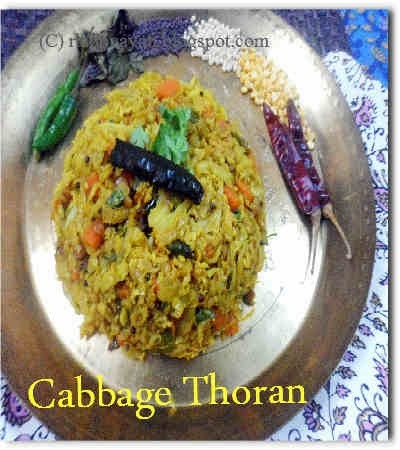 Cabbage Thoran is basically Cabbage stir fry which uses coconut, green chilly, onion and cumin seeds in them. 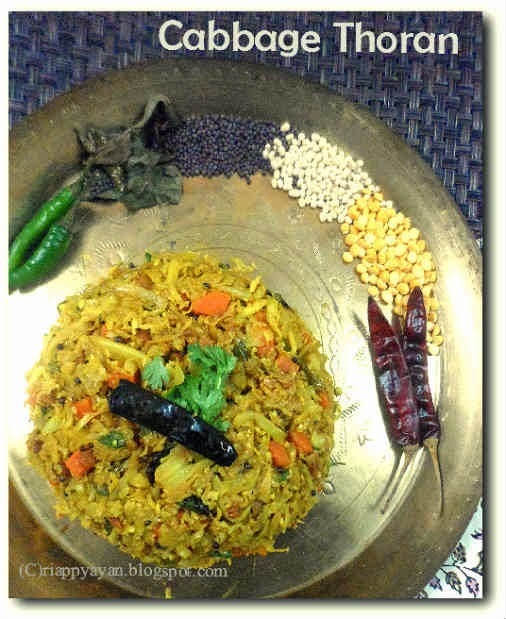 Thoran in general, is an everyday dry curry for rice using any vegetable available. I love the simplicity and the combination of spices used in this preperation. This is kind of soul food for me. Whoever didn't try this yet, it's highly recommended from my side. You can also mix and match vegetables of your choice, just like I did this time with carrot and cabbage. Mustard seed : 1 tsp. Cumin seed : 1/2 tsp. Urad + Chana Dal : 1 tsp. Heat 1/2 tblsp. oil in a pan, add chopped or shredded cabbage and carrot in there. Add salt and turmeric powder. Cover with a lid, some moisture will come out. In low flame, wait till moisture evaporates and vegetables are done. Keep aside. Heat 1 tblsp. oil in another pan, season the oil first with add dry red chilli, then add urad and chana dal, mustard, cumin seeds and curry leaves. When aroma of seasoning comes out, add chopped onion, ginger and green chilli and lastly grated coconut. Stir fry in very low flame for about 2 minutes, then add vegetables. Season with salt, sugar and red chilli powder. Stir fry on medium high heat for another 3-4 minutes or until veges are well stir-fried.Remove from heat, sprinkle some fresh chopped coriander leaves on top, mix well. Labels: Side dish, south Indian recipes, Veg. yummy n delicious fry....nice clicks.